Having pets is one thing, taking adequate care of them is a different aspect altogether. Sometimes, You may require information about the medical care for your pet or the pet may require its quota of food. 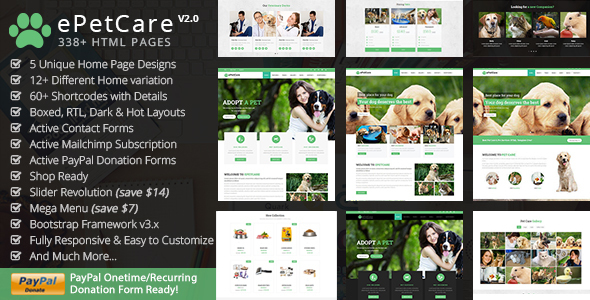 So to give a big boost to the pet shop industry, vet clinics, or personal pet shop retailers, 9+ Animal & Pets Care HTML Templates have been listed below which will help the pet owners to give a proper care and love to their friends with these Animal & Pets Care HTML Templates. 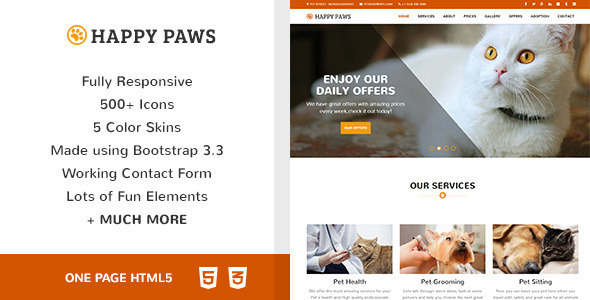 Happy Paws is a clean fully responsive One page HTML made for any Pet & Animals related Business like Veterinarian, Pet Shop, kennel, etc. The theme includes many fun elements that are very easy to edit. 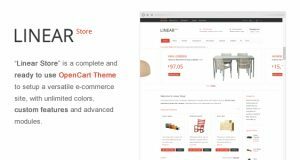 It’s built on the Bootstrap Framework which has a powerful option that makes the theme completely customizable. It Includes five ready-made Color Skins, but you can make your own color scheme yourself easily. 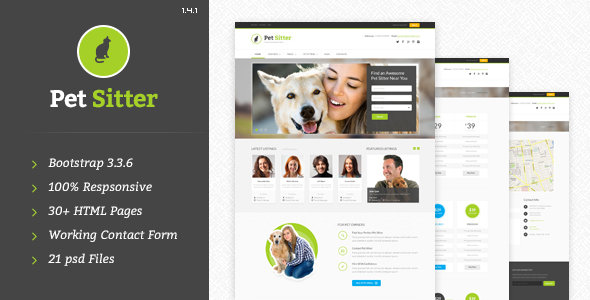 PetSitter is a clean and responsive Pet template. It is suitable for pet sitters site, a pet’s blog or other pet-oriented sites. PetSitter comes with shortcodes page, pricing tables, blog pages with post formats, special pages, contacts page and more. Paws is a Pet & Animal Hotel template created with cute and eye catching design suitable for pet boarding, kennel, grooming salon, non-profit animal rescue organizations. It comes in 5 colors but you can also customize colors to suit your needs. Paws has three header options to pick from. ePetCare is a library for pet & animal care with predefined web elements which helps you to build your own site. This theme is suitable for animal, animal care, animals, care, cats, charity, dogs, donation, Green Peace, help, nature, non-profit, pet care, pets, shelter website. 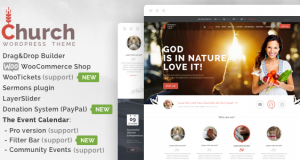 ePetCare theme has a fully responsive layout. It fits perfectly on various displays and resolutions from regular desktop screens to tablets, iPads, iPhones and small mobile devices. 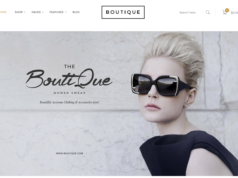 This theme is built with Bootstrap 3. 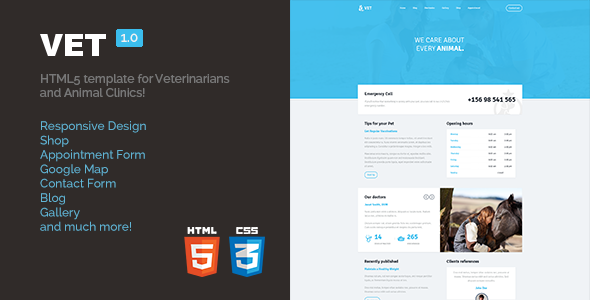 VET is HTML5, responsive template for Veterinarians, Animal Clinic and similar. Template contains 13 HTML files and PHP file for submitting forms. This template is designed in focus to animals care point of view. 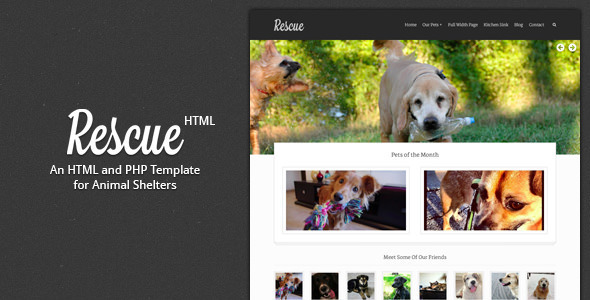 Rescue is an Animal Shelter template built with one purpose: Getting animals adopted. And on the plus side, your shelter can now have an awesome looking website. 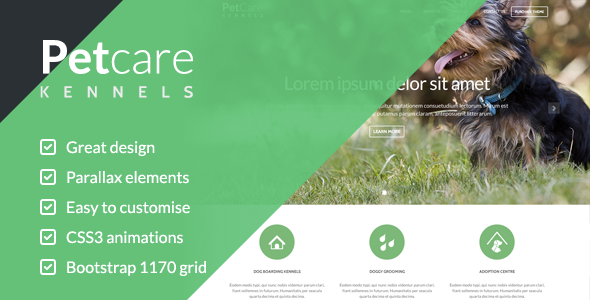 Petcare is fully responsive Pet Care HTML template for pets, health, medical and food websites. Beautiful design created for the pet care companies pet sitter, who offer medical, food services to pets, its single page design along with beautiful blog listing and blog detail page. 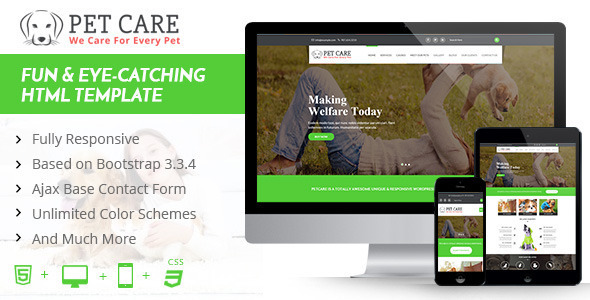 Pet Care is a Responsive Pet Care HTML5 template designed for pet care services, veterinary clinics & similar sites that need responsive and elegant design. Pet care is equipped with multiple features, it cover needs for an online pet care store to a private veterinary clinic. 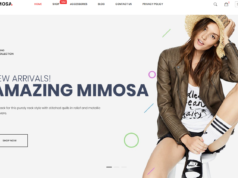 It included multiple gallery templates, mega menu, two contact-us templates, multiple blog pages, multiple blog layouts, services and team template. 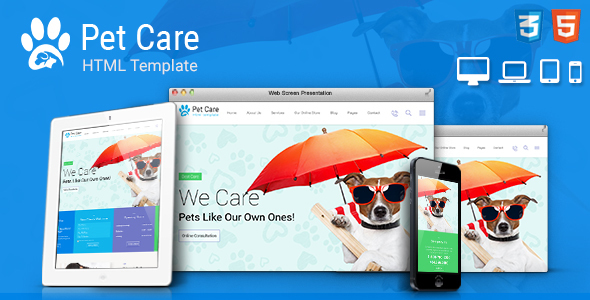 Pet Care is fully responsive template based on Twitter Bootstrap 3.0.2. PetCare Kennels is an elegant, minimal design aimed at dog boarding kennels and the pet services industries. 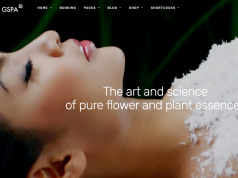 The design is based on the bootstrap 1170px width and utilizes the tablet and mobile views.